Beast Claw's Sponsored Non-Profit Auction Site for Mrs. Hilton's Class and the Humane Society of Charlotte. THE 2018 AUCTION IS CLOSED! THANK YOU to all donors, bidders, and winners! You can also donate directly to either the classroom or shelter campaigns by clicking on the links below. This auction is set up to provide much needed books and basic electronic school supplies at East Forsyth High School in Kernersville, NC. Most of the children in the county are underprivileged and the schools are existing on a bare-bones budget, but with an oversized enrollment. You can visit the school here. This year, the Claws are also supporting a second charity, the Humane Society of Charlotte, in it's efforts to help and place pets post-hurricane Florence. 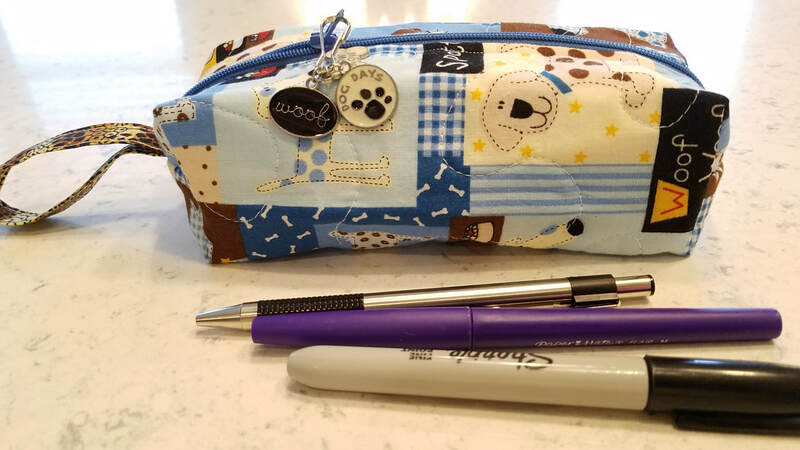 Please bid often and vigorously on the items offered by Jane Yellowrock's Beast Claws Street Team, but keep in mind, the price does not include shipping. Winning bidders will send payment to the Donor's Choose/Mrs. Hilton's Class site, take a photo of your receipt, and send it to the item's donor/creator. Mud will notify winners as soon as possible after each auction closes. Thank you to all donors and bidders. You can still donate directly via the above links! At the close of bidding, each buyer will be put in contact with the seller to arrange economical shipping.Transactions are solely between the buyer and seller, and neither Faith Hunter, Mindy Mymudes, nor the Beast Claws are held responsible for any money collected or donated. ​Thank you all for your generosity, both in donating and bidding! WATCH FOR THE NEXT AUCTION! For those cooler autumn days. 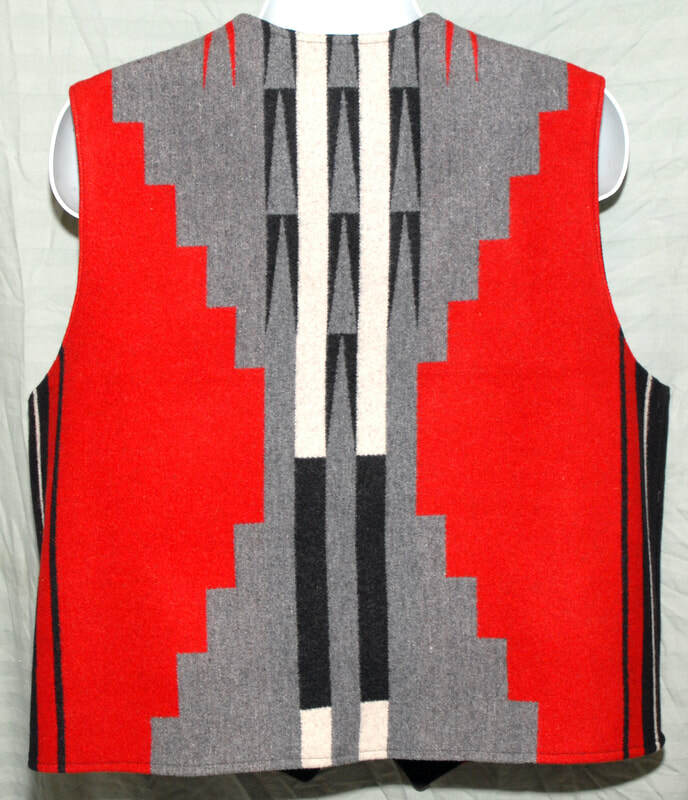 Denim Vest with The National Museum of American Indian Blanket inset in the back. Woman's Large, true to size. ITEM #50 "Jane" Coordinating Jewelry Set CLOSED! Jane's accessories for a night out with Bruiser? This gorgeous set includes a coordinating necklace, bracelet, and two sets of earrings. ITEM #49 Digital Pattern for Cloche CLOSED! Can anyone else picture Katie in this elegant hat during the Roaring 20's? 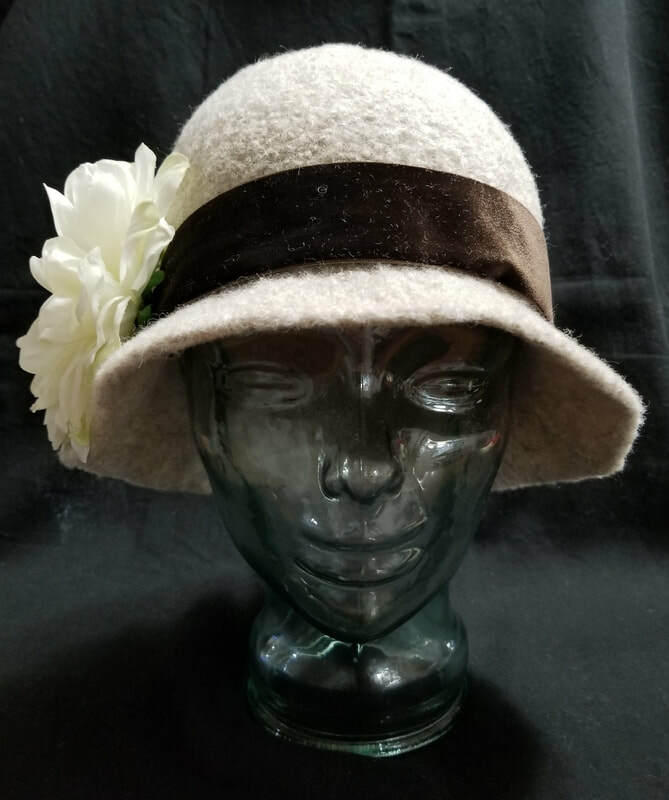 This auction is for a single digital copy of an original knitting pattern for the "Evening At The Rivoli" felted cloche. 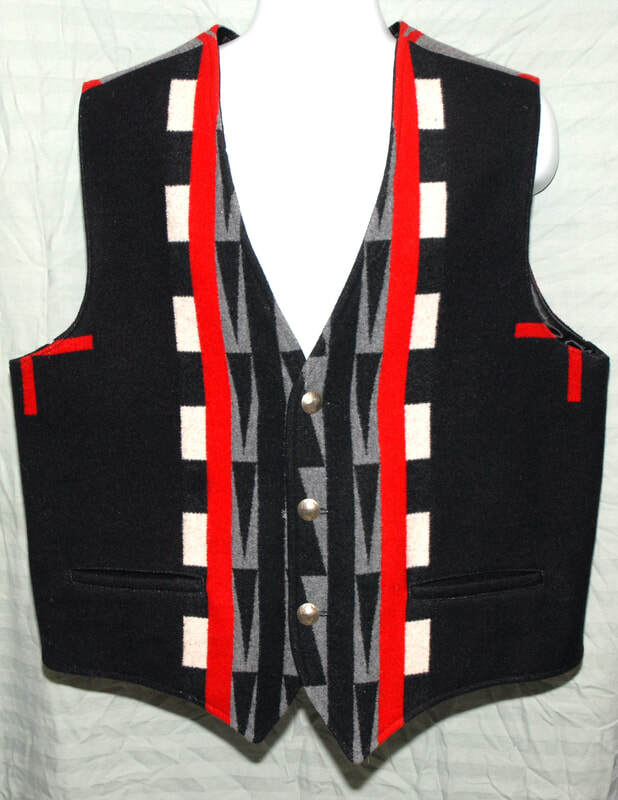 ITEM #48 Hidatsa Indian College Fund Wool Vest CLOSED! 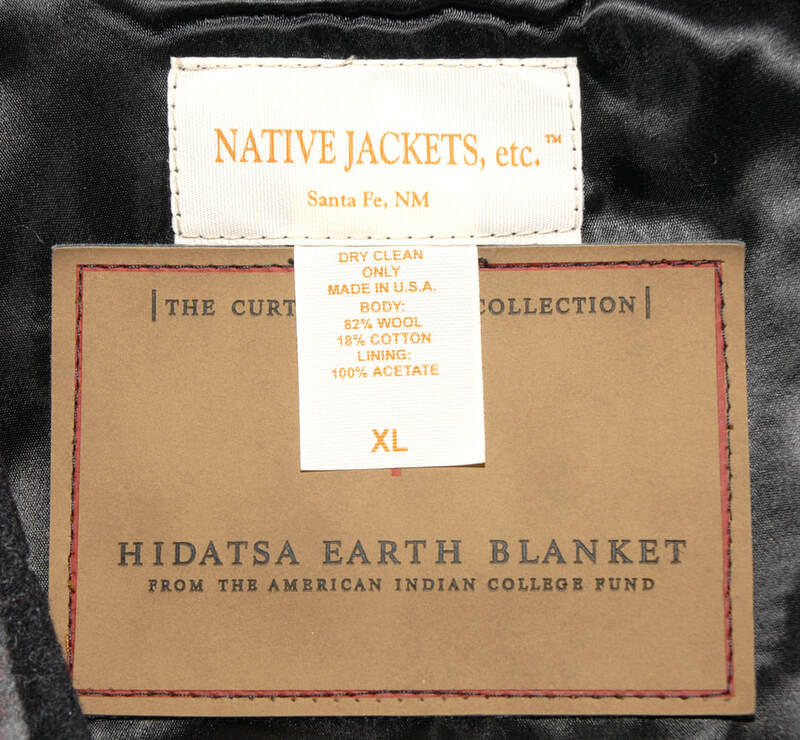 American Indian College Fund Hidatsa Earth Blanket Vest. This gorgeous vest is a generously cut XL. Highest quality wool and fully lined, with genuine Buffalo Nickle buttons. Fashionable and ethically sourced, for a cause that would be close to Jane's heart. ITEM #47 Red F Bomb CLOSED! 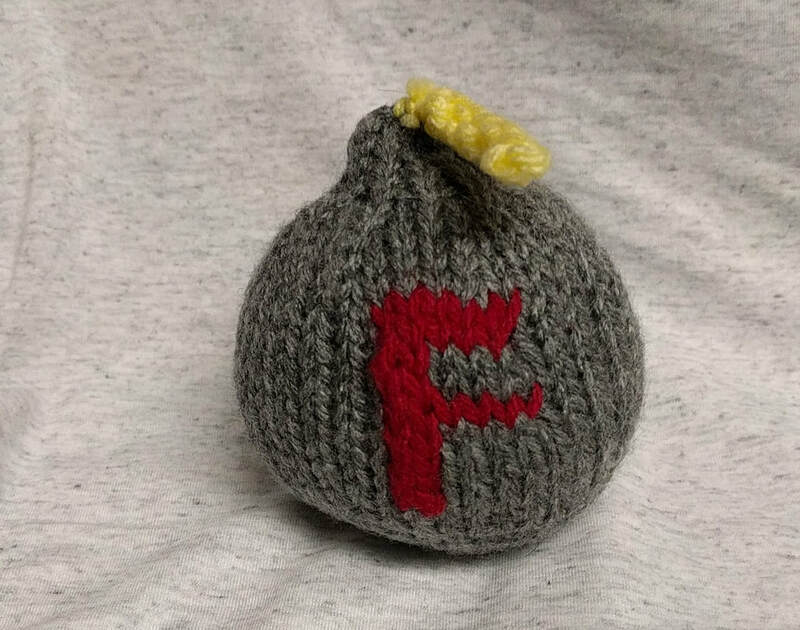 Crotched F Bomb for those bad days. Acrylic yarn. Highly squishable (in place of squishing that annoying person's head). 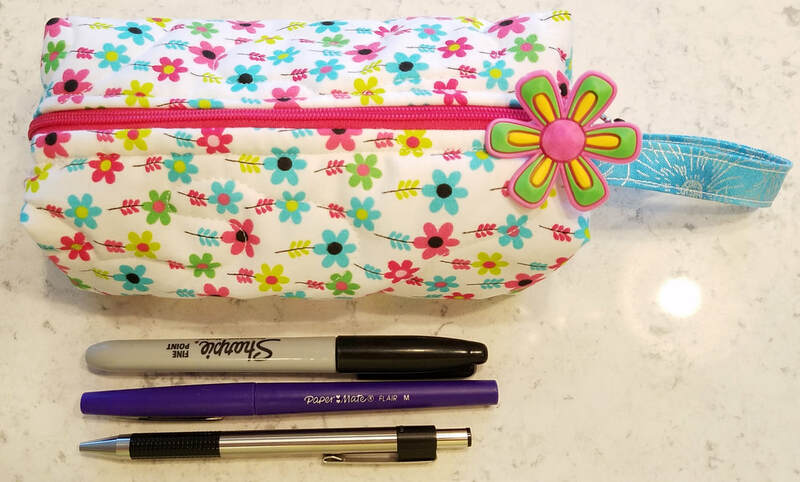 ITEM #46 Adorable Floral Cell Phone/Makeup/Pencil Case CLOSED!! SHIPPING (WITHIN THE CONTINENTAL U.S.) INCLUDED IN THE AUCTION DONATION BID. Shipping anywhere else will be additional. ITEM #45 Woof! 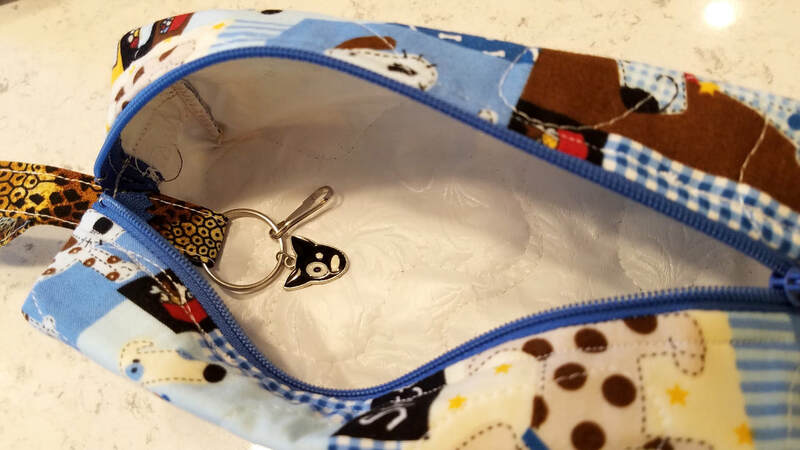 Training Treat/Cell Phone Case CLOSED! 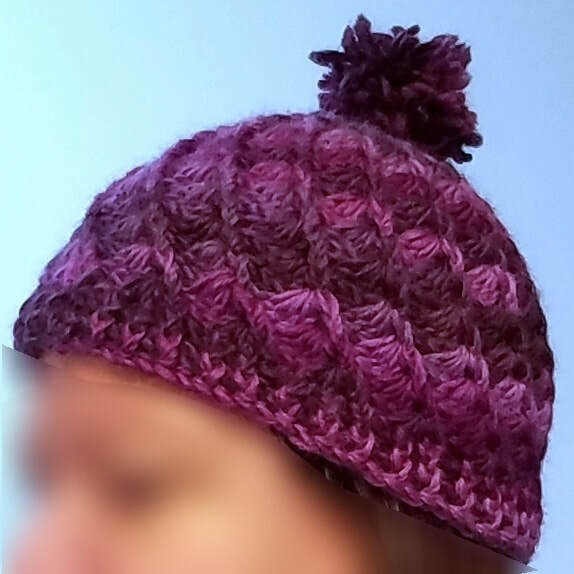 ITEM #44 Hand Crocheted Wool Cap CLOSED! 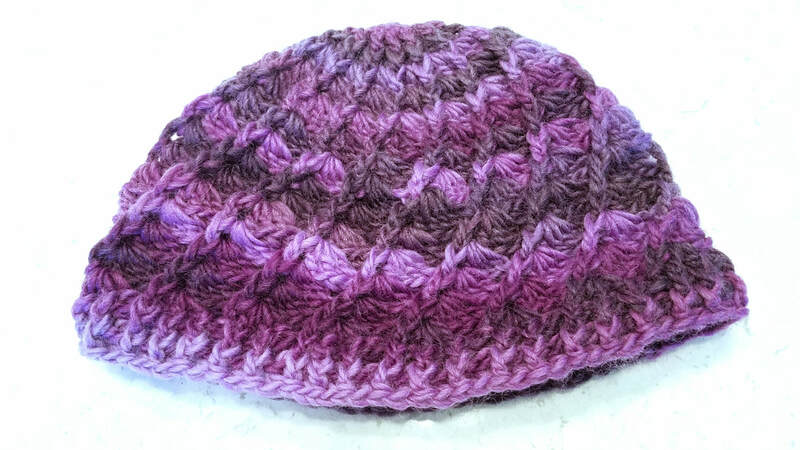 ~Color of yarn: "Purple Iris"
~Hat made from a soft wool yarn that is fairly rough spun. This gives the hat it's distinctive "shaggy"
ITEM #43 Out Clan Priestess Sabina's Bubo bubo Owl Basket CLOSED! Is this the Bubo bubo owl that Jane shifted into when she first met Out Clan Priestess Sabina? 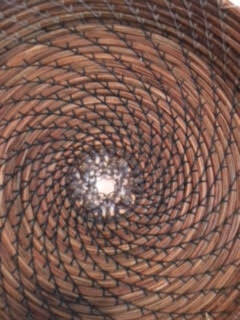 Hand tied Florida long leaf basket created by noted basket maker Marchelle Renee Cote. Accented with blue Czech beads and porcelain owls, with white thread borders. 9 1/2 x 9 1/2 x 1 in deep. The perfect display piece. ITEM #42 Hand Woven Long Leaf Pine Basket CLOSED! ​This display-quality decorative basket from noted basket artist Marchelle Renee Cote is Florida long leaf pine needles with wrappings done using crochet thread and waxed cord. This design has dark brown thread that makes the spiral design out from a filigree metal circle, the thread then changing to clear thread on the side so this gorgeous center spiral design is highlighted. ITEM #41 Hand Made Antique Moss Agate Pin CLOSED! Beautiful moss agate and glass antique pin. Hand made. Donated from the estate of a Claw, from Faith Hunter's private collection. ITEM #40 Blue Bead Drop Earrings CLOSED! Dainty blue beaded drop earrings with surgical steel posts. Created and worn by Faith Hunter, from her private collection. ITEM #39 Coordinating Green and Gray Drop Earrings CLOSED! Green and gray stones with copper beads and surgical steel posts. Created and worn by Faith Hunter, from her private collection. ITEM #38 Two-Souled Earrings #2 CLOSED! Darker green and copper with surgical steel posts. Created and worn by Faith Hunter, from her private collection. ITEM #37 Two-Souled Earrings CLOSED! Light green and copper. Created and worn by Faith Hunter, from her private collection. 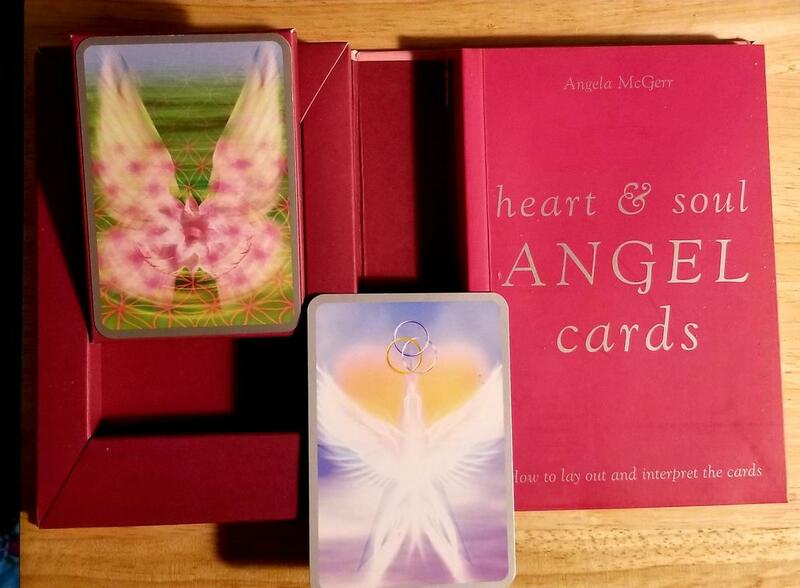 ITEM #36 Angel Wisdom Cards CLOSED! Vintage Harmony Angel cards and book. Offers a fun and effective way to incorporate a little angel healing into your life. Contains a pack of 48 beautifully illustrated cards divided into four suits and an accompanying book that describes the overall meaning of the four suits and the inherent meaning of each card, as well as several different ways of laying them out, and sample interpretations. ITEM #35 The LAST official "Jane Can't Cook" cookbook! CLOSED! This is the last official, signed copy, guys! Straight from the Claws' Kitchens! Jane's, the Younger boys', and the fangheads' favorite appetizer, entree, and dessert recipes. Printed, stapled, and bound so that it can sit in the kitchen along with your other cookbooks. ITEM #34 Jennifer Estep's Gin Blanco books + Spider earrings CLOSED! The first two books from Jennifer Estep's popular The Elemental Assasin series. Meet Gin Blanco, AKA The Spider, and her crew. Plus, a gorgeous pair of spiderweb earrings. ITEm #33B Jennifer Estep's The Bigtime series+ her new Kill The Queen! CLOSED! Jennifer Estep's The Bigtime series, PLUS a copy of her brand new fantasy Kill the Queen. Investigative reporter Carmen Cole gets the surprise of her life on her wedding day when she discovers that her fiancé and best friend are sleeping together—and that the two of them are her town's resident superhero and ubervillain. Shocked and hurt, Carmen reveals their secret identities and then decides to devote her life to unmasking every superhero and ubervillain who crosses her path. A series of successful unmaskings lands Carmen a job at The Exposé, one of the biggest newspapers in Bigtime, New York, a city that's full of superheroes and ubervillains. Carmen is in her element—until she gets kidnapped by the Terrible Triad, Bigtime’s most dangerous ubervillain team. ITEM #33A Jennifer Estep Series CLOSED! Full The Big Time series from Jennifer Estep. ITEM #32 Rachel Caine Library CLOSED! A Rachel Caine bonanza, from her personal collection! Signed copies of her fabulous Weather Warden series, plus all four books in her The Great Library series. 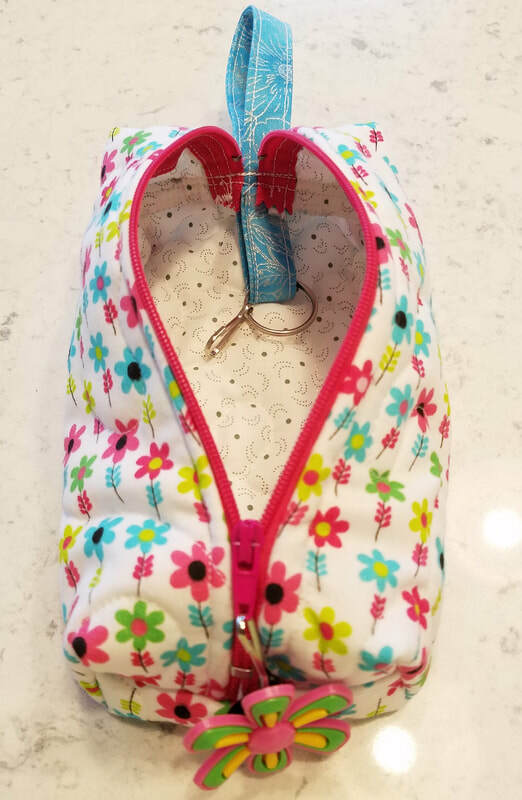 ITEM #31 Mystery Lovers Mini Library CLOSED! For the mystery lovers out there. Medical mysteries by our own Gwen Hunter. A signed Gene Rabe. And the unsinged Phil Rusted series. ITEM #30 They Ley Fantasy Series + Clockwork Universe Steampunk CLOSED! The full The Ley fantasy series by Joshua Palmatier, plus bonus steam punk anthology. First book in Joshua Palmatier's new epic fantasy trilogy, set in a sprawling city of light and magic fueled by a ley line network. Erenthrall—sprawling city of light and magic, whose streets are packed with traders from a dozen lands and whose buildings and towers are grown and shaped in the space of a day. At the heart of the city is the Nexus, the hub of a magical ley line system that powers Erenthrall. This ley line also links the city and the Baronial plains to rest of the continent and the world beyond. The Prime Wielders control the Nexus with secrecy and lies, but it is the Baron who controls the Wielders. The Baron also controls the rest of the Baronies through a web of brutal intimidation enforced by his bloodthirsty guardsmen and unnatural assassins. When the rebel Kormanley seek to destroy the ley system and the Baron’s chokehold, two people find themselves caught in the chaos that sweeps through Erenthrall and threatens the entire world: Kara Tremain, a young Wielder coming into her power, who discovers the forbidden truth behind the magic that powers the ley lines; and Alan Garrett, a recruit in the Baron’s guard, who learns that the city holds more mysteries and more danger than he could possibly have imagined . . . and who holds a secret within himself that could mean Erenthrall’s destruction -- or its salvation. ITEM #29 Silver Wire Beast Earrings CLOSED! 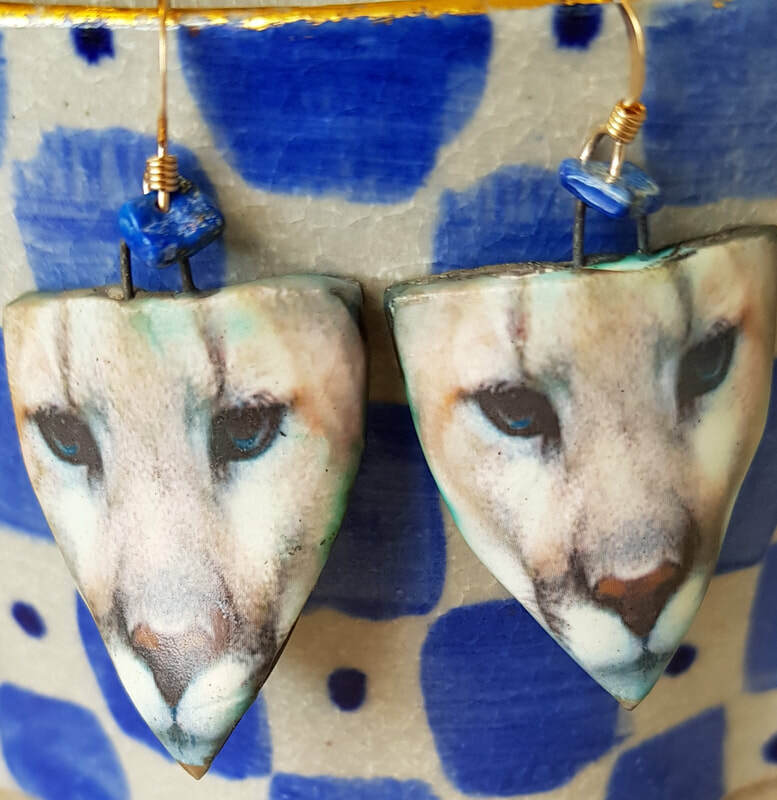 ​Hand painted ceramic Beast earrings. Very light and comfortable at 3.6g or 0.12oz . Made by the lovely Petra of Scorched Earth, in Devon, England, with a small piece of lapis lazuli added to each earring. 3cm or 1.18 inches in length. The french wire on this set is sterling silver. 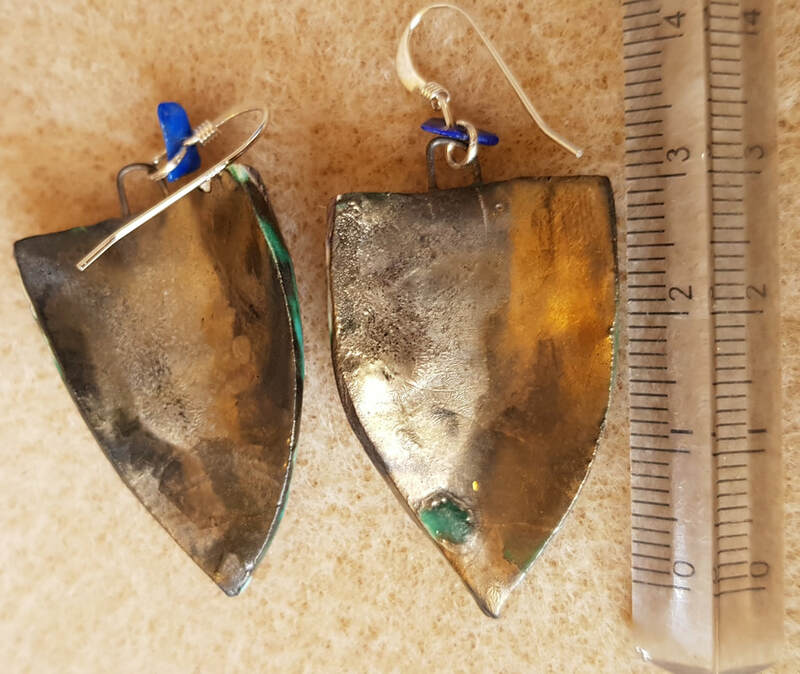 ITEM #28 Beast Porcelien Earrings CLOSED! Hand painted ceramic Beast earrings. Super light weight and comfortable at 3.6g or 0.12oz . They were bespoke and made by the lovely Petra of Scorched Earth, in Devon, England. A small piece of lapis lazuli accents each. The French wire is rolled gold.